I have this thing with entry doors. For years, far back into my childhood, I have harbored a deep love for them. For example, in my home I have a wall which follows my stairway from the main floor to the upstairs and it is lined with framed pictures of entry doors from all over Canada, the States, Mexico, and Europe—ones I’ve personally photographed on trips with my family. They remind me of my childhood home and so many loving memories. You see, my dad let me pick out our entry door when he built the dream home my mom had always wanted. I was five years old and it meant the world to me. Now, when I see an intriguing or unique front door, I imagine that there must have been great care that went into its choosing. Maybe some other daddy let his little girl choose it. Or, maybe there’s an aspiring artist whose creativity has bled into home décor and an inspiring fashion sense. Whatever it is that has me so entranced with entry doors, I do know this: it is the first impression a homeowner can give to passersby and guests. And, I take first impressions pretty seriously. So, what impression does your door give? How much thought have you given to your current entry door? If I can persuade you to ask yourself one question, it would be this: is your entry door inspiring? If not, it’s ok. You can fix it. White house: You can go almost any direction with white siding (unless you happen to have exterior shutters of a particular hue). Deep green, striking red, black, dark blue, and plum are all stunning against white. Brick house: This is another option that allows you almost any colour door: gray, bright red, or light blue. Though, if the brick siding happens to be reddish, stay away from red tones. Oh, and opt for a high-gloss finish, to set it apart from the rough texture of the brick. Tan house: Choose something that stands out, like yellow or forest green. A tan house could easily look drab without a rich colour door to break-up its neutrality. Gray house: I love a gray home. I love gray everywhere, honestly. It’s just so perfectly muted and graciously complementary to a rich turquoise or salmon entry door. If those options are too girly for you, consider a pumpkin orange. What color is your home and do you love your entry door? 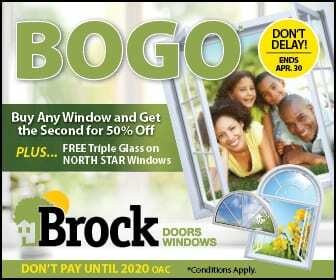 Come visit us here at Brock Doors and Windows to find an entry door in Brampton, Ontario that inspires you; one that welcomes in only goodness and loving memories. We hope to see you soon!